Wire cages sold specifically as mouse cages usually have closely-spaced bars or mesh, so that the inhabitants cannot escape. However, most 'mouse' cages are tiny, and would not provide a suitable permanent home. Many cages sold for hamsters or birds can make good mouse homes, and they can often be bought cheaply secondhand. A photo of an example can be seen below. Alternatively, you could wire together two or more small 'mouse' cages, to make a larger home which still had the advantage of narrow-spaced bars. If an adult human can get a finger through the wire, a young mouse can get out. Single mice are more prone to try to escape than mice which live in groups. Sometimes a mouse may try to squeeze through the bars, get stuck halfway and hurt itself. You can cover wire cages with 1/2" x 1/2"(1cm x 1cm) wire mesh to stop any escapes, or keep the cage in an empty bathtub or on a shelf out of reach of danger for the first month or so until the mice are too big to escape. Often when a mouse escapes from the cage it becomes lonely and wants to get back in; I find that most escapees only try to escape once or twice, before deciding that life is much better if they stay IN the cage! Predatory pets like rats, dogs and cats may attack mice through the bars; make sure that the cage is out of their reach. You cannot rely on mice having the sense to stay away from the bars when other animals are about. If any levels in the cage have wire floors or ladders, they will be corroded by mouse urine and your shiny new cage will be dingy and hard to get clean within a year. Scrubbing the floors with wire wool helps. Alternatively, you can cover wire floors with linoleum ,cardboard, or similar, and simply remove the floor covering to clean or throw away. Bird and hamster cages usually have only one or two small doors. This can make it hard to catch mice - if you have to chase them around the cage to catch them, they will panic. You need to be able to reach all areas of the cage easily. Wherever there is any possibility that a mouse may find it hard to leave a high floor of its cage, leave an emergency water supply in that area. Having parts of a cage which are difficult for a mouse to reach or leave is generally a good idea, as it challenges them, makes life more interesting, and makes them work, but it is vital that water is available at all times in case they become ill, or are just to stupid to get themselves back to their normal water supply. This wire hamster cage has gone down well with my mice. Note ladders and branches to increase climbing surfaces, hanging nestbox and food bowls, plastic tubes (on green top level) to hide in, and wheel. This wheel has spokes - ideally it would be solid -sided, as in the photos of a siamese mouse on a wheel, or fawn spotted mouse on a wheel. Mice love to climb, and wire-sided cages provide good opportunities for this. Climbing is a very good exercise; as well as keeping them physically fit, it helps to stop them getting bored. Great ventilation - mice are prone to respiratory problems which are aggravated by ammonia build-up in poorly ventilated cages. Interesting smells are constantly drifting through the mouse cage, giving them something to think about. Large hamster cages (multi-storey are the only ones worth considering) are fairly cheap & easy to find. Multiple-storey cages allow the mice plenty of floorspace whilst taking up little of yours. You can feed and interact with your mice through the bars. It's great to see a group of little noses appear at the wire every time you pass the cage. You will get a lot more fun out of your mice - and they will become more friendly - if you encourage them to take food from you regularly like this. Easy to fix lots of pieces of cage furniture up to the bars - eg ladders, nestboxes, bird toys etc..
You have to be careful cleaning them - I shovel out used bedding in a dustpan, scrape the corners out with a paint scraper, them spray the inside with disinfectant spray. After this you need to wipe over with clean water so the mice don't have to inhale disinfectant. Heavy, and break if you drop them. To provide maximum ventilation you need to make a lid of wire mesh, no more than 1/2" (1cm) square or youngsters will squeeze through (even large show mice up to 8 weeks old can squeeze through 1" x 1/2" mesh) and they can jump a long way up to grab the wire. If you can be bothered to make a proper wooden frame for the lid, it looks nicer. Mice can't climb up the sides, so you need to put in lots of toys and 'furniture' like pieces of wood for them to climb over - they really love scrambling over different levels. You can make a climbing frame for a tank by simply hanging a piece of wire mesh against one side. Even with a wire mesh lid, aquaria give poor ventilation. Ammonia and unpleasant smells build up in them very quickly. No danger of escape, as long as you make a suitable lid. Mice are protected from other pets which might attack them through cage bars. Bedding can be piled really deep so the mice can burrow through it and play in it without hoofing it all over your carpet. They love deep bedding, and they love throwing it out of the cage. Keeps the smell in as well as the bedding! You can easily watch your mice being excessively cute and playing in the bedding etc..
Cheap and easy to find second-hand; leaks don't matter for mice. Lots of floorspace to arrange toys and furniture on. 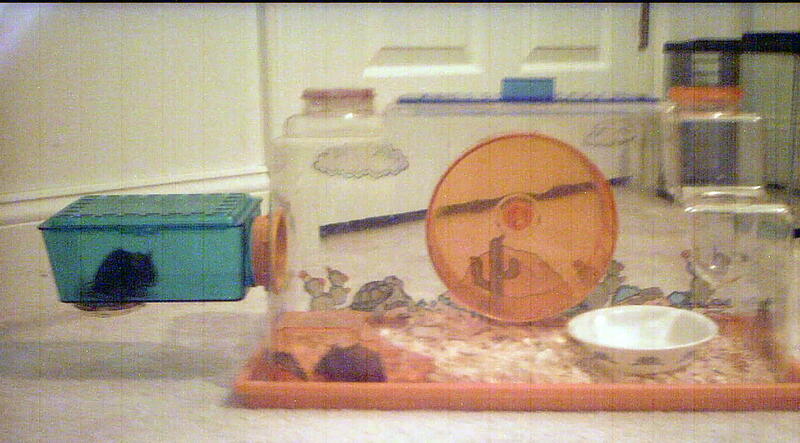 These include plastic tanks which are often sold for rats or cavies, such as the Ferplast Duna or Savic Rody, or boxes, and modular systems designed for hamsters such as Habitrail, Rotastak etc.. is a deluxe version of a modular system, and is an excellent example of a home that will provide adventure and stimulation for its inhabitants. Some hamster keepers maintain that these are not ideal for hamsters, since they are vulnerable to chewing, and are too small for an adult Syrian hamster. They are probably better for mice since mice generally are less intent on escape than hamsters, and are smaller. Watch them for signs of damage in case your mice turn out to be chewers - most are not, but you could be unlucky. Modular systems can be fiddly to dismantle and clean - although James, author of Muffin's story, found that his Sam system could simply be put in the dishwasher. Ventilation may be inadequate - a few holes bored in the plastic will not induce much air circulation. Better to replace the lid with wire mesh if ventilation is poor, or fit a mesh panel. If you have a determined chewer it may escape. Some plastic cages, escpecially clear components like the lid of the Ferplast Duna, are very brittle and easily broken if dropped. With modular cages where different sections are joined by tubes, a mouse may be able to climb up a tube but may have difficulty coming back down. Wherever there is any possibility that a mouse may find it hard to leave a section, leave an emergency water supply in that area. Having parts of a cage which are difficult for a mouse to reach or leave is generally a good idea, as it challenges them, makes life more interesting, and makes them work, but it is vital that water is available at all times in case they become ill, or are just to stupid to get themselves back to their normal water supply. Mice love tunnels, hiding places, and exploring, so modular systems provide a lot of opportunities. Litter is placed on the floor of the cage; another term for it is 'substrate'. Sometimes it is called 'bedding', but this term can also apply to nesting material. The main function of litter is to absorb moisture from droppings and urine, drying them out so that they do not decompose in the cage. Ammonia is given off when droppings and urine decompose. This gas irritates the respiratory tract and makes animals more likely to suffer from respiratory illness. It also smells dreadful, and can make your eyes (and those of your pets) sting. It is therefore a good idea to keep the cage floor dry, and the cage well ventilated, to stop ammonia building up. Litter can also be a plaything for mice, especially if they can pile it up, push it around the cage, or if it is deep enough for them to burrow in. Wood shavings are the most commonly used cage litter for pet mice. See below for concerns about wood shavings. Depending on where you live, the choice may include Spruce (usually the only choice in the UK), Pine (common in USA), Cedar (see below) or Aspen, a hardwood chip (available in USA. In the UK, you can get it from specialist laboratory suppliers). Highly absorbent products such as BioCatolet ( in the UK), CareFresh, SaniChips, BioFlush, Yesterday's News, etc (in the US) are the premium cage litters. They are generally more absorbent than wood shavings, so although they cost more, they last much longer (you only need a small amount), and keep ammonia levels and smells down. They do not contain the phenol oils which cause concerns over wood shavings (see below). In the UK, Bio Catolet is a cat litter made from recycled paper. It is available in some supermarkets and pet shops, and most pet shops will be able to order it within the week for you, if you ask. Some other cat litters are suitable, although I would only use paper- or wood-based ones, not clay-based versions. It is sometimes suggested that peat is used as a substrate for rodents. Peat is not an environmentally friendly product, so I would not recommend it for that reason, but there are numerous peat substitutes and peat-free garden composts that can be used instead. Gerbils and Jirds can be kept very successfully in this manner; they love to tunnel in deep compost, and the compost does not need to be changed for many months. This is because they are desert animals, producing little urine and dry droppings. Mice also enjoy tunnelling in compost, but unfortunately they don't have the same toilet habits. I found that the compost quickly became smelly and damp, fouled with urine and droppings. When not damp, it was dusty. A 'digging box' of compost can be a great playground for mice, but I would not recommend it as a permanent home. Wood Shavings - Pine? Spruce? Cedar? Softwood shavings are thought to cause irritation to the respiratory system and they affect liver function when the mice inhale the volatile oils which they give off. I have reviewed most of the research on this; summaries and references will be added later. The research shows that pine and cedar shavings increase the production of certain liver enzymes, but that doesn't necessarily mean that the liver is being damaged; all sorts of things increase enzyme production, including digesting food. However, until we know more about the effects, it's probably best to be on the safe side and to use an alternative. Keeping your mice on shavings of any sort for a short period is unlikely to have any long-term effect on their health, unless they have an allergic reaction to it - so don't panic and worry that your mice will be harmed for life by a couple of months on the wrong litter. In the UK, virtually all shavings sold for pet bedding are made from white spruce, which has very little effect on liver function - but Bio-Catolet will still keep the smell down better. Cedar shavings have the strongest effect on liver function. They are red-brown in colour, and are sold as deodorizing litter. They are more expensive than many alternatives, and are usually clearly labelled, so you don't need to worry about buying them by accident. Pine shavings have the next strongest effect, and are pale with a strong pine smell. Mice need bedding in the nestbox, for warmth and comfort. The nesting material should be soft, so that they will enjoy building nests with it. It should also be absorbent, to soak up urine, and also condensation - a particular problem with plastic nestboxes. Some people use hay - it smells great, and mice enjoy eating it, but they may catch mites from it, and it isn't very absorbent. Others use commercial shredded paper bedding, or torn up toilet roll/kitchen towel. Most commercial pet beddings that you get at a pet shop will be OK. Cotton wool, and similar commercial pet beddings, can apparently get tangled around toes, so is not recommended - I have not tried this, but why risk it when there are so many alternatives? For breeding, beware of long strands of paper bedding, as newborn mice can get tangled up in them. It's safer to use bedding in small pieces, such as torn up tissues. What toys do mice like? Lots of them! Some suggestions are given below, but mice can have fun with all sorts of household rubbish - boxes, packets etc. Just make sure there is nothing poisonous on it, and that there are no sharp edges. Wooden toys are fun to chew, but get stinky very, very quickly as they absorb urine - so they need to be washed often. Exercise wheels - mice seem to prefer the types with solid treads and sides, and they are much safer (no bits can get caught in them). Mice really love wheels, so do try to provide one.Tubes and tunnels: bits of plastic draining pipe, multi-way pipe connectors that you can buy at hardware/DIY stores cheaply, toilet roll tubes etc. Boxes and cartons that they can hide in. Eggboxes - they love chewing them up. Anything with holes in it that they can weave in and out of - egg racks are particular favourites. Ladders, and for some athletes, ropes. Mice like climbing. Try zig zagging ropes randomly across a side or corner of the cage. My mice love the challenge of finding new routes up and down, one even likes to sleep stretched across them hammock style, and they prefer the rope maze to using their ladder.